Lasercarb® - Only at Rijdam you can find this unique form of lasercladding! The Lasercarb® process was developed by the R&D department at Technogénia. The process is an excellent choice to repair and/or (preventively) improve machine parts, to make them durable and extent the life-time. 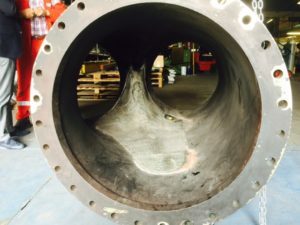 The principle involves using the energy of a diode laser to very slightly melt the filler metal, such as the Technolase® carbide powders, and the base metal. Lasercarb® does not affect the carbide grains, which maintain their intrinsic qualities. The deposits are metallurgically welded to the base metal. They are also extremely dense, very precise and easily reproducible. The Lasercarb coatings are used successfully in various industries, such as oil drilling, steel, papermaking, food processing and waste recycling. Manufactured since 1986 by Technogénia by means of a patented technique known as cold crucible electromagnetic levitation, this unique and innovative Tungsten Carbide goes by the trade name of “Spérotène®”.Its main feature is its very fine metallurgical structure known as “tangled needles”. Sphérotène® consists of spherical particles of extreme hardness : 3000VH ± 500 (VH = Vickers Hardness).The exceptionally clean surface of Sphérotène® makes the derived products highly weldable. The spherical shaped particles of Sphérotène® have the advantage of giving maximum compactness. This means that the mean free path between the spheres in the weld deposit is minimal. Therefore, erosion of the softer matrix is minimized.